When it comes to making guitars, there’s probably nothing more difficult and sophisticated than making an archtop electric. The typical cigar box guitar is basically the easiest to make. A little soldering and some found objects and you’ve got something ready to play. Next comes the standard electric guitar which requires some basic woodworking and set up skills. Then there’s the acoustic, which requires a finer set of woodworking skills and experience. Then, at the top, is the archtop, which to me represents the pinnacle of guitar craftsmanship. And this is what Dan Krugman of Brooklyn’s DDK Guitars specializes in making. Why is the archtop so difficult to make? Well, it’s the top, which must be carefully chiseled into an arch, like that of a violin. This piece not only delivers the signature tone, but is also pretty difficult to make, which is probably one reason we don’t see a ton of them these days. But they are beautiful. I got the chance to visit Krugman recently to see how he makes his guitars, and also play a few too. And yes, I can confirm that they play so fine, and sound even better. Krugman is onto something and I’m excited to share a look into his shop. Here’s a bit of a discussion we had about his craft and how he got into it. Well, I'm a luthier (a person who makes stringed instruments) working in Gowanus, Brooklyn. I specialize in acoustic guitars and primarily what are called “archtop” guitars. I also repair and restore stringed instruments of all sorts. Outside of my workshop, I do some educational work teaching various groups about how stringed instruments work and how they're made. How long have you been making guitars for and what drew you to it? I've played guitar since I was a kid and have always taken them apart, swapped things around, tried different setups and strings, etc. In my twenties, I started by building an electric guitar from pre-made parts. That turned out alright so I tried an acoustic from a kit. Then I bought some raw pieces of wood and made my own. This was all while I was working a day job. On the side I would do repair work and setups for friends who were musicians. After a while I reached a point where I had to decide if I wanted to keep dividing my attention or throw myself into lutherie full-time. I worked for a while in a communal woodworking studio in Brooklyn and in 2011, I moved into my current space and I haven't really looked back. Can you describe the style of guitars you make for us? The type I make most often are called “archtop guitars.” When most people think of an acoustic guitar, it usually has a flat top with a round hole in the middle. Archtops, however, are carved like a violin and the arched shape is part of what gives the top its strength. You can see a nod to that tradition in the f-holes on either side of the bridge. These guitars are typically associated with jazz, but back when they were first introduced in the 1920s and 30s, they were used for all sorts of music. You're starting to see them pop up in more genres now and I'm really excited to help bring back some of that variety. What is it about making guitars that you love? You mentioned something to me about the joy of making an instrument - in that it’s sort of a tool for an artist to create. Part of the reason I started making acoustics was that they only sound like what they're made of. The sound is, in a way, built-in to the guitar by the types of wood, their dimensions and arrangement. It is essentially making an empty box. Yet somehow out of this box comes beautiful music. I still think there's something magical about that transformation. While I find the process of making an instrument extremely gratifying, from laying out a new design to choosing the woods, shaping and tuning each piece and assembling them all together; but hearing what all of that work amounts to once it's strung up and played, there's nothing quite like that. What is your ultimate goal when you’re making an instrument? Well at its most basic level, an instrument is really a tool that someone else uses to create something of their own. My job is to make that tool responsive, easy to use, and pleasing to look at. Though I do spend quite a lot of time on the design of my instruments, I prefer to keep the ornament to a minimum and focus instead on the sound and the feel. A guitar that sounds good and is super comfortable to play is going to be the one you reach for first. In my view, the best possible outcome is to have a guitar that almost disappears once you start to play. It should just be you and the music. It's kind of hard to say. In one way or another, I'm always thinking about how to do what I do better so I tend to find inspiration in all sorts of places. When you're a hammer, everything looks like a nail. Obviously I look to the work of instrument makers past and present for guidance. I've also been lucky enough to become friends with some great makers whose work ranges from very traditional to downright revolutionary and I draw a lot of inspiration from them. As for developing my own ideas, I would say that I'm always drawn to strong, simple design; where form is almost inseparable from function. Can you tell us about the process of making a guitar? How long it takes and what you’re thinking about when you’re actually making one? It depends a little bit on the guitar but it usually takes four to six weeks to complete and maybe a couple more for the finish to completely cure. It starts with picking the right woods. Different types of woods influence how the guitar sounds so you already begin to shape the sound right from the start. Then I usually make the top and the back at the same time since they're largely similar processes. Then you bend the sides to the desired shape and glue in a block at the neck and tail ends reinforce them at the ends. After that you carve the neck and join it to the body. I like to string up the instruments before I finish them just to make sure everything is where I want it to be. Then it's time to put the finish on. 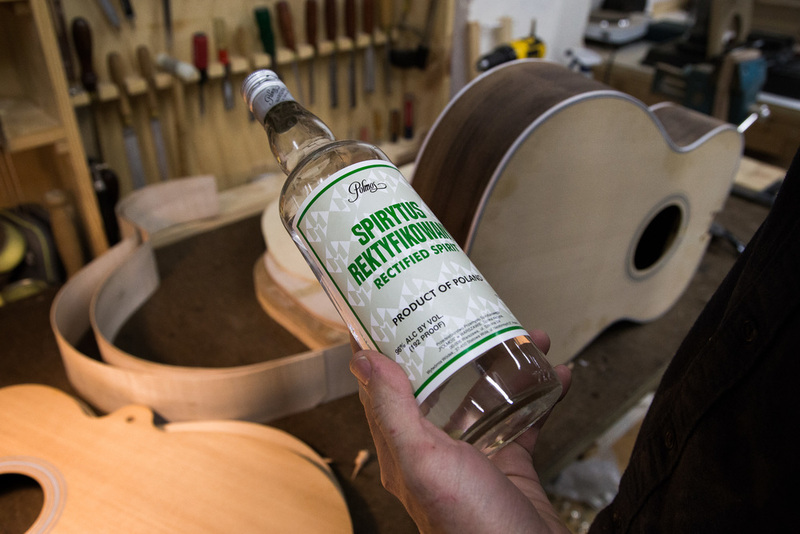 Once the finish is cured, you string it back up and fine tune the setup before it's ready to play. Are there upcoming projects that you’re excited about. Yes, I'm working on a new one right now that's a flat top version of the smaller model I make. It incorporates a few new elements that I've been percolating for a while so I'm excited to see how that turns out. Is there anything you want to try making that you haven’t yet? I have kind of a running list of things that I'd like to try when I get a chance. I'd really like to expand my very limited knowledge of metalworking and engraving, but those are kind of ongoing skill-building exercises. Any advice for anyone who might be thinking about getting in instrument making? Don't be afraid. There are loads of resources out there to learn and when I began, I found that luthiers are a pretty friendly bunch. Most of them were very happy to have me drop by and would answer any questions I had about how they did things. That's a kindness I'm happy to pay forward when people reach out to me.